The formation of any new state is a fascinating time, let alone the creation of a modern state that possesses an ancient history and rich culture. The Kyrgyz Republic is in the process of re-discovering its national identity. There is no better medium for instilling values and uniting people than education. This paper will examine trends and changes in the teaching of Kyrgyz culture and identity in secondary schools in the Kyrgyz Republic, with a focus on cultural education since the fall of the Soviet Union. In particular, this paper argues that the teaching of Kyrgyz culture in secondary schools is a symptom of aversion to the rigid ideological education of the Soviet period. Furthermore, it is the result of a growing pride and interest in traditional Kyrgyz values. Austen Dowell is a senior majoring in Russian/International Studies at Dickinson College in Carlisle, Pennsylvania. He hopes to work with the US Government or an NGO after graduation. By the end of the 1920s, the Bolshevik government conquered and started consolidating the territory formerly known as Russian Turkestan. The Kara-Kyrgyz Autonomous Oblast had been formed by 1919, and the region was given republic status as the Kyrgyz SSSR in 1936. The Bolsheviks had the unenviable task of simultaneously developing these territories while preventing separatism and insurrection. This balancing act was accomplished by promoting what the Bolsheviks viewed as critical aspects of a socialist society: literacy, education, and social equality.In order to push past the bourgeoisie chauvinism of the Russian Empire, it was deemed critical to develop and promulgate concrete national identities for each republic. By giving pride of place to clearly defined national identities, such as Kyrgyz or Uzbek, the Soviet Union would enjoy the equal and hearty support of its members. Each republic was more or less divided in order to give an official government status to a selected ethnic majority. Education was considered a vital tool to bring about a transition from what the Bolsheviks deemed a “pre-modern” society to a society that resembled their ideological ideal. Better educated citizens meant better Communists, and this push for literacy and education was part of a conscious effort to escape the perceived backwardness of the Russian Empire and the nomadic/premodern local societies. Soviet planners fostered nationalism while promoting an internationalist ideology in the Soviet Union, including the outlying republics. Early Soviet nationality policy promoted the creation of titular “nations,” new social and cultural groupings that would link their people through common historical, linguistic, and cultural bonds. Members of the titular nations were to be promoted to positions in local government and management, and promotion of local culture and pride was supported by Moscow. Local languages were to take greater priority and be used in any and all aspects of public life. The perceived backwardness of the former Empire was encapsulated by the concept of Russian chauvinism, wherein it was perceived that ethnic Russians and Russian culture had been promoted in an attempt to drown out national cultures. Party organizers in the early years of Soviet rule in Central Asia were intent on reversing this trend, as the Communist party had swept to power by demanding the equality of all citizens. However, the policy also pushed these titular nations to shed ideals that were incompatible with Soviet socialism, such as Islamic practices, local “superstitions,” bride-kidnapping or close family bonds. Initially residents in the outlying republics received education in their native tongues while taking classes on Russian language, or they could opt to study at a Russian-language school. Underlying this choice was the reality that if parents wanted their children to succeed in the party-dominated government, they would send them to receive an education in Russian. Soviet rulers feared pan-Turkism, or the idea that various Turkic peoples such as Uzbeks, Kazakhs, Kyrgyz, etc would unite in regional solidarity, and Islam was viewed as a potentially dangerous, unifying factor ever since Russians first gained control over Turkestan. In the earliest days of the region, Russian organizers had local political and educational elites such as the Jadid (more liberal, reform-minded Muslims) to help establish their rule. Texts and monuments, looted by Russian forces, were returned with much fanfare. In nomadic Kyrgyzstan, where the populace was mobile and scattered, the community’s religious polymaths conducted most formal education. Education was more of a holistic experience than a matter of learning how to read or operate machinery. The religious aspect of education, the madrasa, was regarded as non-Soviet and subsequently banned. This method of education was an anathema to Communist planners, who both feared Islam and sought to utilize all labor. By 1926 Soviet rule was sufficiently ingrained and the state began to tackle the perceived incompatibility between Soviet and madrassa education. Mosques were destroyed, and Islam retreated from the public sphere, including from educational institutions. Local language schools, with a focus on local affairs, were to remain open, but without any hints of religion. The Soviet state used education to “develop” the Kyrgyz because they were seen as members of an underdeveloped culture in its infancy. Soviet planners hoped to simultaneously reeducate the populace away from Tsarist and capitalist mentalities, while also focusing on reforming specific cultures of the titular nations, such as Kyrgyz nomadism or Uzbek religiosity. To a certain extent, this was a conversation focused on relative technological development. Soviet rulers possessed advanced weaponry, everyday technologies, and the ability to massively improve infrastructure. This mismatch is apparent when considering the language situation. The Kyrgyz were made aware that their own language was incapable of expressing many of the latest technological and scientific concepts. Russian, as a big brother language and regional lingua-franca, would be used to fill in gaps in knowledge. In addition, the traditional Kyrgyz lifestyle, nomadism, could not by definition play any part in the new, industrialized utopia advocated by the Soviets. This perceived gap in development could easily bleed into older trends of Russian chauvinism, given the large numbers of Russians and other Slavic settlers arriving in Central Asia beginning in the 1860s. As part of Soviet ideology, the state made efforts to replace the family unit, regarded as bourgeois, with the teacher. Islam was dismissed as antiquated, and religious schools that had been allowed to function in the 1920s were banned as early as the 1930s. Expression of religion through dress or accessories was forbidden in public life. A clear example of this attempt to simultaneously create a Soviet society while reducing opposition among the native populace in Central Asia was the Soviet push to unveil Muslim women. The movement, known as hujum, was conceived of and enacted during the mid and late 1920s. Soviet rulers viewed the practice of veiling women as backwards and part of an overall trend in diminishing the rights of females. Hujum allowed the Soviet government to pursue both ideological policy goals (the equality of all Soviet citizens, regardless of gender) and practical ones (the mobilization of the entire workforce to meet the increased demand for labor). Traditionally secluded, Islamic women were certainly not expected to work in factories or outside the home. However, hujum could also be seen as an attempt to break the stranglehold of local cultural values on society. The attempt was met with stiff resistance and was eventually abandoned. While the practice of veiling had been historically limited to a small percentage of women in Central Asia, primarily ethnic Uzbeks of higher social classes, Soviet heavy-handedness was attacked as cultural insensitivity and chauvinism. As mentioned earlier, the content within Soviet Central Asian schools was a mix of local cultural subjects and socialist propaganda. A large part of this transition was the Korenizatsiyaprogram, which revolved around the development of native cadres to serve in local Soviet governments. This program created historical bonds and shared cultural values in an attempt to delineate national cultures in the 1920s and 1930s. Russian anthropologists defined historical figures and language groups, and they were the first to write down and record the history of the Kyrgyz. It is important that this research was supposed to articulate the unique culture and history of the Kyrgyz nation, as defined by the new Soviet demands including certain ideological parameters. A stellar example is the cult hero Manas, who through the help of Soviet educators was transformed from a more pan-Turkic figure to a specifically Kyrgyz hero. Generally regarded as the cultural and political father of the Kyrgyz people, Manas and his exploits make up the first “book” of the epic Manas trilogy, with the remaining two parts, Semetei and Seitek, chronicling his son’s and grandson’s mission to defend the Kyrgyz people from Khitan and Oirat enemies. The age and exact origins of the legend are lost to history, with many Kyrgyz claiming that the epic is over 1,000 years old, while several experts claim that the poem only coalesced in the 17th or 18th century. The Soviet republics were not to enjoy the benefits of indigenization programs for long, as Communist Party policy soon shifted on the eve of World War II. Russification, or the process of culturally and linguistically assimilating other nationalities into Russian language and cultural practices, would dominate the Soviet educational system until the end of the Union. If earlier the focus had been on promoting local practices and language as part of building national identities, policy now shifted to dissolving these identities quicker as part of the push to create the ideal “Soviet” citizen (which by this time was perfectly understood to mean Russian). In the tense years before the outbreak of World War II, Stalin had authorized the deportation of large amounts of ethnic minorities, and even executed regional leaders such as Faizullah Khojaev and Akmal Ikramov in the Uzbek SSR. This distrust of minorities was to bleed into the educational system. By the time that Nikita Khrushchev had become First Secretary in the 1950s, non-Russian schools that served ethnic minorities in their native languages were already being phased out. The stated goal of the Party was sblizhenie, or the concurrent support of Soviet republics while incorporating them all into the inevitable Soviet super-state, but minorities would have to sacrifice in order to reach this ideal. In the words of Khrushchev, “The obliteration of national distinctions, and especially language distinctions, is a considerably more drawn-out process than the obliteration of class distinctions.” Soviet policy-makers would maintain this natural primacy of Russian language and culture until the end of the Union. In summary, this was not an education in “bourgeois” cultural development. Soviet officials were interested in developing national cultures as part of an ideological and calculated political move. Indeed, Stalin was open when he stated that the purpose of cultural education was the creation of new ethnic groups that were “proletarian in form, national in form.” Soviet education is praised for spreading literacy and introducing themes of a common brotherhood. It also helped create what many would consider the historical and cultural roots of the modern Kyrgyz nation. However, the Soviet state was also intent on shaping this legacy in keeping with the Socialist ideology. Soviet officials isolated aspects of Kyrgyz culture including religion, cultural ties with the Turkish and Arab world, and aspects of Kyrgyz history, such as the Basmachi Revolt, that did not fit within the Soviet historical narrative. A number of local educators and professionals helped contribute to research for this paper, among whom four were willing to be interviewed on the subject of cultural education and the change from the Soviet-style educational system in Kyrgyzstan. Interviewees were selected as experts from various types of educational institutions; the interviewees represent public and private high schools, a public university, and a private hybrid language school. Interviewees were self-selected, having responded to requests for an interview, and all of the interviews were conducted during the month of April, 2016, in Bishkek. Potential questions were formulated ahead of time in English, and then translated into Russian. Several of the interviews were partially conducted in Kyrgyz as well, with Kanykei Kojomberdieva helping translate responses to questions. All of the interviewees freely answered a variety of questions, including potentially politicized or sensitive cultural issues, and each interview lasted about an hour. Talgat Derkembaev, a Kyrgyz language and history teacher with 18 years of experience, represented the public school system. Nazgul Ordobaeva, who works as a teacher at the Seitek Turkish Sebat School offered an insight into private education. Askar Esenovich Bayserkeev has presided over a number of institutions and is currently dean at Eastern University in Bishkek. Kanykei Kojomberdieva, who has studied and taught in a variety of countries including Malaysia, Turkey, Ukraine, and Kyrgyzstan, was also interviewed. The most salient and immediate change that overtook the Kyrgyz education system after independence was a transition from centralized curricula and state-required models of education to localized instruction. The transition also included a spectrum of private, religious, and public schools (with private and public schools defined further by the language, Russian or Kyrgyz, in which they conduct the majority of their lessons). This change was a product of slashed government budgets, connected with regional economic dislocation and the decreased ability of national governments to fund education. Decentralization was pursued by regional and community leaders, who called for the devolution of power to the oblasti, or regional local governments. This gave locals more freedom and flexibility in making choices about education, while the federal government was able to pass costs to oblast governments. Forbidden under the Soviet Union, madrasas, or Islamic religious schools, have made a major comeback in the last 25 years. While there are a wide variety of such educational institutions, they are divided into those providing elementary and secondary education. In addition, post-secondary religious institutions are available for students who graduate from high school in the ninth grade at a secular institution. At these schools, students begin a purely religious education that will prepare them for a career in the clergy, or simply for personal spiritual fulfillment. Students can attend religious schools that focus on religious education starting in elementary school, while still offering an array of traditional classes dealing with secular subjects. When asked where he would send his children to study, Mr. Derkembaev, a public school teacher, stated that he values religious schools, because a religious education helps the Kyrgyz connect with their spirituality, culture, and moral values, which can help in any profession. 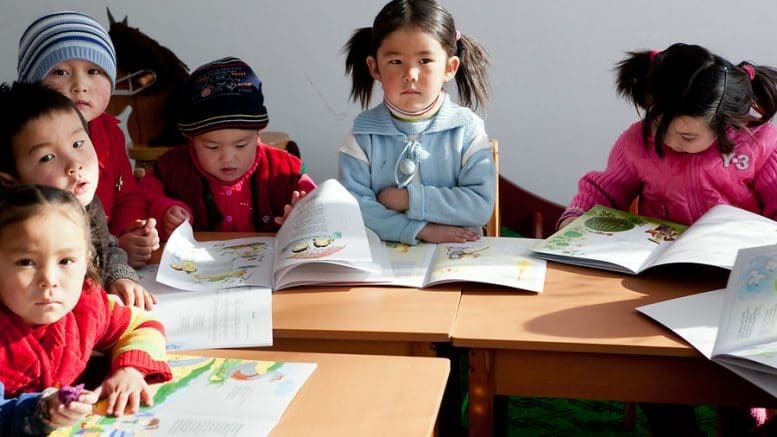 In the absence of funding for public schools, a multitude of private educational organizations and schools has appeared in the main cities of Kyrgyzstan. Typically tuition-based, these schools generally have less oversight from the government, can develop curricula to suit their goals, and are viewed as more prestigious and elite than public and religious schools. Heightened expectations and competition for teaching positions improve accountability and efficiency among faculty members, while funds from donors can often make for high-tech classrooms and clean buildings. This diversity of options also results in a wide array of programs aimed at instilling Kyrgyz values and teaching Kyrgyz culture. In addition, many of the private schools focus on language learning, expanding beyond the Russian, German, and English taught under the Soviet Union to include languages such as Chinese, Turkish, and Arabic. Public schools also have this flexibility in offering languages, although to a lesser extent than private schools. Curricula are mandated by the government and include a core of essential subjects, such as mathematics and geography, which are combined with a variety of electives. There are no specific cultural classes, but every institution is keen to help develop the burgeoning Kyrgyz culture. The teaching of world literature, world history, and Kyrgyz history is almost universal. Languages of instruction vary, but Kyrgyz is becoming the dominant language of instruction. The shift from education under the Soviet Union is also visible in the preparation of children for the job market. In general, children are encouraged to pursue a wider variety of jobs. This is partially due to technological advances, as there are simply more types of jobs and specializations available. However, the transition from a command economy to a free market economy has also resulted in growing demand for artists, writers, designers, and other more specialized professions. Soviet education was described by Mr. Bayserkeev as flat, with the majority of students being prepared for the more prosaic technical positions demanded by the local labor market. The countrywide resurgence of interest in Kyrgyz traditions only strengthens this movement toward diversification. Students are more inspired to take risks professionally and develop their own interests in order to express their heritage. Compare this description to the current situation, where the most expensive Kyrgyz movie ever produced, Kurmanjan Datka, depicts the eponymous heroine as the veritable mother of the Kyrgyz people. She is portrayed as a noble figure that embodied the tragic patience and history of the Kyrgyz under Russian occupation. The clearest example in educational courses is Manas. Whereas once he was portrayed as an almost embarrassingly backwards and antiquated strongman, he is now known as the father of a nation and spiritual guardian. The lavish Manas Ordo complex in Talas was recently erected, and schoolchildren from all over the country make trips to visit this extensive museum. All across Kyrgyzstan schoolchildren sing his praise and participate in competitions to see who can memorize the epic trilogy of Manas, Semetei, and Seitek. The figure of Manas is used almost religiously, as a guardian and representative of pious Muslims, as a strong leader, and as a patriot that all Kyrgyz should aspire to emulate. This trend of historical revisionism has continued in the sphere of historical textbooks, where fierce competition exists in representing a “fair” version of Kyrgyz history. When the five-volume History of the Kyrgyz People (Tabilda Akerov) was published in 2015 many greeted it with fanfare. Mr. Bayserkeev confirmed that it is considered one of the first uniquely Kyrgyz textbooks written for the Kyrgyz. Kyrgyz education has suffered since the fall of the Soviet Union from a dearth of modern textbooks, given that previously most textbooks were produced in Moscow or the Russian SFSR. However, this process of reinterpreting Kyrgyz history is complicated. The histories of the two nations are so intertwined, that history books can only rail against Russian influences for so long before they accidently attack their own people or legacies. It was the Kyrgyz who first sought Russian protection against their nomadic enemies; and many of their famous leaders, such Bopombai Bekmurat uluu, derived their power from their successful cooperation with Russian forces. This is likely to continue to be complicated, as Mr. Derkembayev said, “Our cultures and history are too close, and we cannot call them our enemy.” While this was a diplomatic remark, he then followed up by slyly repeating an old Kyrgyz proverb, “Орус менен дос болсон ай балтанды ала жур.” (When you become friends with a Russian, make sure you have an axe nearby). Similar revisionism has overtaken the teaching of literature. Well known authors such as Chingis Aitmatov are now revered, and their novels are mandatory reading in schools. In the last 25 years, the breadth of authors has increased and oral literature is now considered a vital part of the Kyrgyz cultural legacy. The study of these authors often includes the idealization of these figures as moral examples. When Aitmatov is praised as a world-famous author, it is almost always in the context of being a humble, simple man from rural Kyrgyzstan. As Mr. Bayserkeev positied, this means that one should follow their dreams and express their culture, while also indicating that it is now economically sound to consider a career in the arts. This idealization of rural Kyrgyz lifestyles represents a return to simplicity in Kyrgyz society. Mr. Bayserkeev pointed out that more and more students are using the freedom of choice under the new educational system to become artists and authors, because there is economic and cultural prestige associated with these jobs now. In education, this cultural transition is progressing on two fronts. First, there is the effort by educators and scientists to determine what exactly it means to be culturally and genetically Kyrgyz. Mr. Bayserkeev proudly mentioned a Japanese study conducted on the ability of Kyrgyz to memorize entire sections of the Manas epic poem and recite them for days on end. The study suggested that this ability was simply part of Kyrgyz genetic structure, and locals certainly believe that they possess a unique bond with their history and environment. Historians and archeologists are constantly working to locate the ancient ancestors of the Kyrgyz, with several modern researchers suggesting links with the Scythians, Huns, Mongols, and Yenisei Kyrgyz. Ms. Ordobaeva suggested that Kyrgyz are simply more flexible and better students than other ethnicities due to their nomadic history, with traditions of resourcefulness and hardiness embedded in their genetic code. She was also quick to suggest that there are only four or five ethnicities that possess such intricate oral histories. The second front of this promotion of Kyrgyz culture has been the noted pursuit of globalization in education. The Kyrgyz language has become a status symbol. Those who speak it well are often accorded higher respect, and it is now a prerequisite for higher education or a career in government. However, economic and international realities have contributed to a shift in priorities in the development of Kyrgyz cultural education. Russian language still commands a high place in education. This is linked with the political situation; wherein significant Russian minorities in Kyrgyzstan necessitate retaining Russian as a government language. Additionally, despite the shift in historical focus, Russian is still the de facto language of opportunity in the region. Over a million Kyrgyz work or study in Russia. Economically, even for the more privileged, Russian is still the lingua franca of international or prestigious positions, despite the resurgence of Kyrgyz as a language of importance in Kyrgyzstan. Education is increasingly globalized. English has also quickly come to dominate a significant number of private schools, and almost all public and private institutions teach English. At many private schools, such as the prominent Oxford school, this goes beyond language classes. Students are taught exclusively in English, in the Western liberal model (encouraging critical thinking and analysis), and the schools host events for Western holidays such as Halloween or Christmas. English is viewed as a vital tool in the global economy, as well as for travel purposes, and many ambitious families seek to give their children a cultural appreciation of the much-vaunted West. Turkish language education constitutes the last new cultural development. Spearheaded by the Sebat Education Institution, nine Turkish-language elementary schools and 16 secondary schools (where boys and girls study separately) have been established in Kyrgyzstan. These schools are regarded as highly adept at instilling the values of hard work, humility, discipline, and good behavior, while still being able to teach Kyrgyz culture, language, and history. Ms. Ordobaeva, a teacher at the Sebat school, was quick to emphasize the successful combination of Kyrgyz values with the more modern values associated with Turkey, such as cutting-edge educational techniques and the breadth of languages offered (students were taught in Kyrgyz, but learned Turkish, English, and Russian). Aditionally, the Kyrgyz commonly view Turkey as a brother nation. Both countries speak Turkic languages and take pride in a shared history. At all of these institutions, whether international, public, private, or religious, each interviewee mentioned approximately the same definitions for what a cultural education for Kyrgyz should entail. They were adamant that the Kyrgyz are neither Russian nor Soviet and should seek to find their own true values and identity. As to what these values include, all four of the interviewees mentioned: respect for elders, knowledge of the creation and history of the Kyrgyz people, respect for the natural environment, patriotism, and tolerance for others. Typical cultural events at most schools include cooking classes for national dishes (accompanied by the wearing of traditional Kyrgyz dresses and kolpaks – traditional Kyrgyz felt hats), and Manas recitation. Manas holds a special place in Kyrgyz education in general and Mr. Derkembaev stressed the importance of the tale as one of few reliable accounts of ancient Kyrgyz life and traditions. Given that the state has articulated neither a defined Kyrgyz identity nor ideology; certain aspects of cultural pluralism have proven problematic. The first clear example of this is the relationship between religion, the Kyrgyz government, and the public. As Ms. Ordovaeva mentioned, religion was banned during Soviet schooling, and after independence, masses of Kyrgyz became more interested in their religious heritage as Sunni Muslims. People considered religion a traditional part of Kyrgyz culture and identity, and they embraced it in their search for a return to purely Kyrgyz practices. The populations of Central Asia are mainly Sunni Muslim, with over 86% of the Kyrgyz identifying as Muslim. Islam has a long, rich history in the region, having arrived with Arabian invaders in the 8th century. The region is generally regarded as the heart of Sufiism, and has produced many Muslim luminaries, such as Al-Khwarizmi and Avicena. The situation has become more muddled after the religious repression of the Soviet Union and declaration of independence, and civil society is simultaneously developing a place for public religiosity while rejecting a fundamentalist state that various state (Iran, Pakistan) and non-state actors (The Islamic Renaissance Party, the Islamic Movement of Uzbekistan, The Islamic State of Iraq and the Levant) advance. Thus, when religiously conservative families began clothing their daughters in hijabs, the majority of educators and families greeted this form of cultural expression with distaste. Mr. Derkembaev recounted the case of two sisters who came to school in hijabs, and the principal attempted to expel them for it. The hijab, it was said, had no place in Kyrgyz Islam and was a red flag for religious fundamentalism. Mr. Derkembaev was adamant, however, that the Kyrgyz people must embrace modern ways of living and other cultures in order to be successful. In addition, the treatment of Uzbek-language schools in the south of Kyrgyzstan shows that tolerance for minority rights has lapsed. Although the most numerous minority groups, including Uzbeks, Uighurs, Tadjiks, and Dungans, have created their own schools, the Uzbek organizations have found themselves subject to state-sanctioned discrimination since the 2010 ethnic riots between Kyrgyz and Uzbeks. Uzbek organizations have complained of being locked out of political positions, while the political tensions between Uzbek and Kyrgyz communities have routinely boiled over in the last decade. These schools have suffered more than a 60% decline in students over the last decade, with many students switching to better-supported Russian language schools. An increasing number of schools are converted from Uzbek to mixed or Kyrgyz language schools each year. Attempts to create an Uzbek-language textbook with the help of the Kyrgyz-Uzbek University, which resulted in the creation of the Textbook Development Center in 1997, foundered and closed due to a lack of funds. The Kyrgyz government desires a strong, united country, despite the threat of Uzbek non-affiliation. Local autonomy or southern Uzbek identity building could, in theory, lead to the area becoming autonomous or being annexed by Uzbekistan. In conclusion, Kyrgyzstan’s transition from Soviet subject to sovereign state has seen a flowering of cultural expression and pride. The developing Kyrgyz educational system represents an expression of this growth. Various parties have competed to advance their versions of historical events and Kyrgyz nationalism. Some efforts to idealize Kyrgyz characteristics have even echoed Soviet models. This process of developing education for the 21st century is marked by a surprising amount of diversity and attempts to define Kyrgyz values. On one hand, the Kyrgyz government has occasionally engaged in heavy-handed efforts to define and control Islam in Kyrgyzstan and to limit the place of minorities in civil society, but on the other hand this growth of interest in Kyrgyz culture is community-driven. The Kyrgyz people are willing to embrace other cultures while empowering and rehabilitating their own cultural legacy. The competing trends of rejecting Soviet influences while also embracing Kyrgyz cultural values have resulted in the creation of a complex system that skillfully blends international and domestic educational goals. The author of this analysis, Austen Dowell is a senior majoring in Russian/International Studies at Dickinson College in Carlisle, Pennsylvania. He hopes to work with the US Government or an NGO after graduation. Sevket Akyildiz, “Aims, Goals, and Implementation of Soviet Education in Central Asia,” The Eurasia Studies Society Journal, 2012. Hasan Ali Karasar, “The Partition of Khorezm and the Positions of Turkestanis on Razmezhevanie,” Europe-Asia Studies, 60(7):1247-1260. 2008. Chulos, Chris J., and Timo Piirainen. The Fall of an Empire, the Birth of a Nation: National Identities in Russia. Aldershot, England: Ashgate, 2000. Mark Dickens, “Soviet Language Policy in Central Asia,” Oxuscom.com. 1988. Khalid, Adeeb.”Islam after Communism: Religion and Politics in Central Asia.” Berkeley: U of California, 2007. Ismailova, Baktygul. Language Policy in Central Asia. Amherst: U of Massachusetts, 2001. Sevket Akyildiz, Richard Carlson, “Social and Culture Change in Central Asia: The Soviet Legacy,” Routledge, London, 15-19. 2013. Northrop, Douglas Taylor. Veiled Empire: Gender & Power in Stalinist Central Asia. Ithaca: Cornell UP, 2004. .
 Tchoroev, Tyntckbek. Historiography of Post-Soviet Kyrgyzstan. Vol. 34. London: Cambridge UP, 2002. Akiner Shring, Nicholas Sims-Williams, “Languages and Scripts of Central Asia,” School of Oriental and African Studies, London. 1997. “Tost Tovarishcha Stalina Russkomu Narodu.” Cyber-USSR. N.p., 1995. Yaroslav Bilinsky, “The Soviet Education Laws of 1958–59 and Soviet Nationality Policy,”Soviet Studies 14, 138–157. 1962. Anderson, Barbara A., and Brian D. Silver. “Equality, Efficiency, and Politics in Soviet Bilingual Education Policy, 1934-1980.” Am Polit Sci Rev American Political Science Review 78.04, 1019-039. JSTOR. 1984. Dickens, Mark. “Soviet Language Policy in Central Asia.” Oxuscom.com. 1 Jan. 1988. Mertaugh, Michael. “Education in Central Asia, with Particular Reference to Kyrgyz Republic.” The Challenge of Education in Central Asia, 2004. Russian-language translations were provided by the author, while Kyrgyz-language translations were provided by Kanykei Kojomberdieva. Hope and Fear: Kyrgyz Migrants in Russia,” IRIN, 2014. Эл аралык Себат билим беруу мекемеси.” 01 May. 2016. Farangis Najibullah, “Turkish Schools Coming Under Increased Scrutiny in Central Asia,” Radio Free Europe Radio Liberty, 2009. Pew Forum report on Muslim Populations. Online. Nate Schenkken, “Kyrgyzstan: Hijab Controversy Charges Debate over Islam’s Role in Soiety,”Eurasianet.org, 2011. “Kyrgyz Madrasah Principals to Lose Licenses,”, Radio Free Europe Radio Liberty, 2016. “Kyrgyzstan: Uzbek-Language Schools Disappearing.” Eurasianet.org. 6 Mar. 2013. “Kyrgyzstan: Uzbek-language Schools Disappearing”, Eurasianet.org, 2013. Khan, Sam. “Kyrgyzstan’s Uzbeks Say ‘Our Voices Are Not Heard. '” RadioFreeEurope/RadioLiberty. 22 June 2010. Kinzer, Stephen. “A Legendary Hero Guides Kyrgyzstan.” The New York Times. 2 Jan. 2000. “Эл аралык Себат билим беруу мекемеси.” Online, 01 May 2016. “Ислам в Киргизии: рост разнообразия.” Muslim-info.com. 24 Oct. 2015. Web. 7 Apr. 2016. “Правительство Киргизии озаботилось состоянием религиозных школ.” Islam.kz. 7 Jan. 2016. Web. 5 Apr. 2016. “БАЗИСНЫЙ УЧЕБНЫЙ ПЛАН ДЛЯ ОБЩЕОБРАЗОВАТЕЛЬНЫХ ОРГАНИЗАЦИЙ” Kutbilim.com, 4 May 2015. Web. 19 Apr. 2016. Abramzon S.M. “The Kirgiz and Their Ethnogenetical Historical and Cultural Connections,” Moscow, 1971, p. 45. Web. 14 Apr. 2016. Akiner, Shirin & Sims-Williams, Nicholas. “Languages and Scripts of Central Asia.” 1997. School of Oriental and African Studies, University of London. p. 99. Web. 07 Apr. 2016. Akyildiz, Sevket. “Aims, Goals and Implementation of Soviet Education in Central Asia.” The Eurasia Studies Society Journal, 1.1 (2012): 1-14. Web. 05 Apr. 2016. Akyildiz, Sevket, and Richard Carlson. “Social and Cultural Change in Central Asia: The Soviet Legacy,” London: Routledge, 2013. Print. 06 Apr.2016. “ALL CHILDREN IN SCHOOL BY 2015 GLOBAL INITIATIVE ON OUT-OF-SCHOOL CHILDREN: KYRGYZSTAN COUNTRY STUDY.” Rep. no. B. UNICEF, 2012. Web. 07 Apr. 2016. Anderson, Barbara A., and Brian D. Silver. “Equality, Efficiency, and Politics in Soviet Bilingual Education Policy, 1934-1980.” Am Polit Sci Rev American Political Science Review 78.04 (1984): 1019-039. JSTOR. Web. 05 Apr. 2016. Ismailova, Baktygul. Language Policy in Central Asia. Amherst: U of Massachusetts, 2001. Print. 01 Apr. 2016. Chulos, Chris J., and Timo Piirainen. “The Fall of an Empire, the Birth of a Nation: National Identities in Russia.” Aldershot, England: Ashgate, 2000. Print. 17 Apr. 2016. Dickens, Mark. “Soviet Language Policy in Central Asia.” Oxuscom.com. 1 Jan. 1988. Web. 3 Apr. 2016. Hasan Ali Karasar, “The Partition of Khorezm and the Positions of Turkestanis on Razmezhevanie,” 2008. Europe-Asia Studies, 60(7):1247-1260. Web. 05 Apr. 2016. “Hope and Fear: Kyrgyz Migrants in Russia.” IRIN. 24 Apr. 2014. Web. 20 Apr. 2016. Khalid, Adeeb. “Islam after Communism: Religion and Politics in Central Asia.” Berkeley: U of California, 2007. Web. 14 Apr. 2016. “Kyrgyzstan: Uzbek-Language Schools Disappearing.” Eurasianet.org. 6 Mar. 2013. Web. 1 Apr. 2016. “Mapping the Global Muslim Population.” Pew Research Center (2009): Web. 15 Apr. 2016. Mclean, Hugh. “Advancing Open Society through Curriculum Reform in Kyrgyzstan.” Open Society Foundations. 21 Nov. 2014. Web. 15 Apr. 2016. Mertaugh, Michael. “Education in Central Asia, with Particular Reference to Kyrgyz Republic.” 2004. The Challenge of Education in Central Asia. Web. 04 Apr. 2016. Northrop, Douglas Taylor. “Veiled Empire: Gender & Power in Stalinist Central Asia.” Ithaca: Cornell UP, 2004. Print. Web. 10 Apr. 2016. RFE/RL’s Kyrgyz Service. “Kyrgyz Madrasah Principals To Lose Licenses.” Radio Free Europe Radio Liberty. 23 Feb. 2016. Web. 18 Apr. 2016. Schenkken, Nate. “Kyrgyzstan: Hijab Controvery Charges Debate Over Islam’s Role in Society.” Eurasianet.org. 12 Oct. 2011. Web. 13 Apr. 2016. Shrin, Akiner, and Nicholas Sims-Williams. Languages and Scripts of Central Asia. London: School of Oriental and African Studies, 1997. Web. 17 Apr. 2016. Tchoroev, Tyntckbek. Historiography of Post-Soviet Kyrgyzstan. Vol. 34. London: Cambridge UP, 2002. Print. Ser. 2. Web. 10 Apr. 2016. Tentisheva, Aida. “To Wear or Not? Religious Dress in Kyrgyzstan’s Schools.”Next.upi.com. United Press International, 18 Oct. 2011. Web. 1 Apr. 2016. “Tost Tovarishcha Stalina Russkomu Narodu.” Cyber-USSR. N.p., 1995. Web. 15 Apr. 2016. Umetov, Chingiz. “Kyrgyzstan: Uzbeks in Southern Regions Wrestle with Cultural Dilemma.” Eurasianet.org. 26 Oct. 2009. Web. 15 Apr. 2016. Yaroslav Bilinsky, “The Soviet Education Laws of 1958–59 and Soviet Nationality Policy,”Soviet Studies 14.” 1962. 138–157. Web. 17 Apr. 2016.